Which Security Cameras Offer the Most Free Cloud Storage? Wireless security cameras and video doorbells are pretty impressive. They provide a sense of security by keeping a virtual eye on your home, but without sufficient cloud storage, a missed notification on your smartphone can have less than desirable consequences. That doorbell chime alert that you missed and could not review due to lacking cloud storage could have been a delivery from Amazon…or a burglar casing your home for a future visit at a later date. The majority of manufacturers have opted for cloud-based storage over local storage. 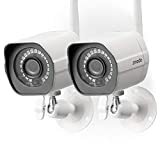 However, not all home security cameras include free cloud storage and those that do bundle cloud expenses in with the retail price only provide a few days worth of backups. In short, this means if you want to review footage anywhere from a few days back to a couple of weeks ago, you will have to bite the bullet at pay a monthly or annual fee for a cloud storage plan. Keep in mind; this is on top of the sticker price of the camera (or cameras) that you purchase. There are two major types of recording options in these paid storage plans. Cameras featuring motion-based recording only begin recording when they detect motion, whereas cameras with continuous recording record and save every second of their 24/7 live video feed and store it for playback later. Netgear shares the title for most free cloud storage with a rolling seven days of free storage of motion-based recordings from up to five Arlo cameras. The base station also accepts a USB drive for optional local storage of recorded video. If your needs exceed the rolling seven-day entry-level offering, you can purchase 30 days worth of storage for up to ten cameras at $10/month or $99/year. Netgear maxes out with a sixty-day plan for up to fifteen cameras at $15/month or $149/year. SkyBell offers two different video doorbells – the SkyBell HD and the SkyBell Trim Plus. Unlike every other brand on this list, SkyBell does not provide a paid storage option. Instead, they offer seven days of motion-based cloud storage. Zmodo is a newcomer to the lower-priced video doorbell and security camera frontier. Despite their thrifty product offerings, Zmodo gives you 36 hours of free motion-based video storage, which lays waste to companies like Nest and Ring. Better known for their smart locks, August also contends in the video doorbell arena. August recently announced that users now get 24 hours of free cloud storage with a premium subscription option with 30 days of motion-based cloud backup for $5/month or $50/year. Security camera startup Canara provides one day of free motion-based storage. If your needs surpass this base package, you can opt for a Canary membership ($10/month or $99/year for up to five devices), which expands your motion-based video cloud storage to 30 days. The upgrade option includes two-way audio and camera access via an internet browser. Netvue provides an assortment of budget-friendly security cameras and video doorbells. However, they do not offer any free cloud video storage. Instead, the company provides users free instant alert images, which the devices capture when they detect activity. If cloud video storage is a must, Netvue offers two paid plans: doorbell ring-based recordings for $2/month or $20/year, or seven days of continuous video recording for $5/month or $50/year. Unlike the other companies, Ring, who was just bought out by Amazon, doesn’t give any free cloud storage. Instead, users receive smartphone alerts, but unless you open the live feed right away, you may miss the action. For motion-based cloud video storage, users need to subscribe to a Ring Protect Plan, which comes in two varieties. The basic plan gives users 60 days of storage for $3/month or $30/year/camera and the Plus plan give the same 60 days of storage and a lifetime warranty for an unlimited amount of cameras per home at $10/month or $100/year. While Ring does not offer a free tier, their prices are quite reasonable when stacked next to the competition. Like Ring, Nest does not offer a free video storage option. Instead of a free alternative, Nest provides the last three hours of snapshots, which are screenshots of the camera take when activity is detected. The company does offer its Nest Aware service, which gives users access to additional types of alerts – such as one that lets you know the camera has detected a person in its field of view – activity/motion zones and non-stop video storage. Nest Aware comes in three packages that vary based on the amount of video storage you require. Five days of continuous storage costs $5/month or $50/year; 10 days costs $10/month or $100/year, and 30 days of non-stop coverage costs $30/month or $300/year. It is important to note that each plan only supports video from one Nest camera, which means you will need to subscribe to additional methods for each other camera.